Good news for all Opera fanboys and fangirls. With the launch of Opera 11 Final, Norwegian web browser has been already downloaded more than 6.7 million times. A significant boost when compared to Opera’s 10 million downloads within the first week of Opera 10 release. According to Opera Software, a survey of people downloading Opera for the very first time has shown that 53% of its respondents were using Firefox web browser while 43% used Internet Explorer. However, no data were given about the Google Chrome or Safari newcomers. It looks like Websockets aren’t so great after all (at least in the short term). According to Mozilla and Opera posts, both companies will be disabling support for such technology until serious security flaws are fixed. Mozilla said that Firefox 4 Beta 8 will be the very first release to do so, while Opera has not yet commented on version specifics. Recently, Adam Barth has shared a security study findings that raised a red flag for the current state of Websockets protocol. It looks like Opera Software is having a party as company has announced the milestone of 150 million Opera users worldwide. If you visit Opera.com, it will display an actual inbox of Jon S. von Tetzchner, the co-founder of Opera Software. 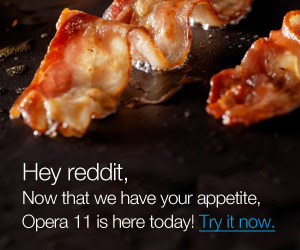 Happy browsing and congratulations to Opera Software! Hardware acceleration is great if you are running Vista or Windows 7 machines. However, when it comes to XP or other operating systems, you won’t be able to experience the very best of it. Joe Drew, the developer of Firefox web browser is considering writing a hardware accelerated backend to canvas, possibly in collaboration with other browser maker (you are welcome to join). Oh boy, here we go again. Just a quick shout out from Opera Software as company plans to release the Beta version of Opera 11 web browser tomorrow. According to the latest Opera Software financial report, company saw a modest desktop users drop over the period of last two quarters. Recently, Opera Software has reported their Q3 2010 financial results. Revenues continued to increase for the desktop browser, while Internet devices saw a 2% decrease (Q2 vs. Q3). Opera Mini user base keeps growing while desktop browser lost more users. With all the “problems” that plagued Skyfire for the iOS launch, the numbers are in. According to the MobileCrunch post, a company behind mobile web browser Skyfire has sold more than 300 000 copies for their first weekend. Now, Skyfire will obviously not receive all that cash, as Apple wants their cut as well (30%, if no exclusive deals were made). That still leaves the company with more than 600,000 USD to spend on candies and chocolate.